It is well known that around 3,500 women travelled from Ireland to Britain to get abortions in 2016, which, from a population of around 4.5 million, is a rather high number. In 2016, the stats I’ve studied, 3,500 women did travel. Only 2,500 of those were [hesitates] white Irish. So they weren’t all, er [hesitates again], native Irish women. So that’s a reduction in that. What’s that last bit? I think I missed it when I fell off my chair. Wowzers. You see? A reduction. Really, there were only 2,500 abortions, because black Irish and non-Irish women don’t count as people. What an exquisitely delightful person. For information, the last Irish Census was conducted in the same year, 2016. It recorded a “white Irish” population then of 3.85 million, or some 82% of the total population. 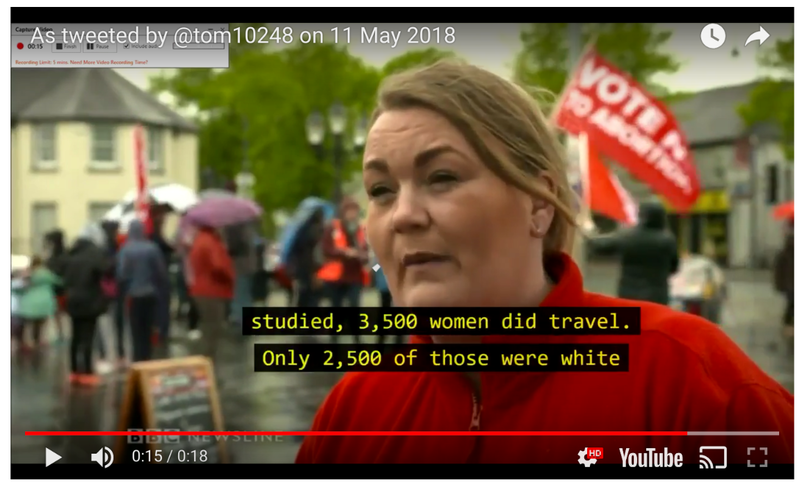 Also, the correct number of women recorded as travelling from Ireland to Britain that year was not 3,500, but rather 3,265. So if this lady is correct that 2,500 of those were “white Irish”, then such proportions pretty much reflect those of the overall Irish population at the time. There is no racial skew in Irish abortion figures. To suggest otherwise is to blow a xenophobic dog whistle at the conservative right, linking abortion to foreignness and implying that real native-ethnic Irish people are somehow purer than those who immigrate into the country. Racism is never a good look. It’s a shame these anti-abortion activists don’t have any authoritative role models in their lives who could guide them through this moral maze and teach them about its manifold ethical complexities. Oh wait. Here’s a guy.